Furrballz Ragdolls Est. 1998 - Contract / How Young? We at Furrballz Ragdolls have been looking into adding an official written legal contract on all Adoptions from the cats we breed. Up until this season (2007-2008) we have always been very careful to verbally go thru the expectations and conditions that are there for not just our benefit, but yours. Now we have a written contract that has been legally checked, for all Ragdolls that are adopted from us. We believe this is for both ours and your benefit. It is listed below for you to have a look over even before you contact us. Any Breeders wishing to use a version of this contract is welcome to as long as they remove any and all mention of us or our cattery and exchange it for their own. Any contracts remaining with our details on it and does not originate from us will not be honored in any way shape or form. Initial $100 deposit will guarantee to hold your cat. All monies paid are non-refundable, but are transferable to another cat. Show / Breeder Quality kittens sold as pets MUST be paid in full before being Spayed or Neutered by Furrballz Ragdolls at (10-12 weeks of age). If Furrballz Ragdolls finds it in the best interest of the cat/Kitten, Furrballz Ragdolls has the right to cancel this contract and refund all monies paid, before buyer takes possession of cat/Kitten. If for any reason the above buyer becomes unwilling or unable to keep the Cat and provide the cat with proper food, shelter, and medical attention, the above buyer agrees to surrender the cat to Furrballz Ragdolls, unconditionally, with no reimbursement or refund to the above buyer. The buyer agrees that the cat will not be sold, traded or given away to any pet shop, laboratory or adoption facility that has any kind of euthanasia practice, or be re-sold or destroyed without notifying Furrballz Ragdolls. If buyer is purchasing the cat as a show quality cat, buyer may show the cat in shows; however, Furrballz Ragdolls makes no representations or guarantees. The cat will not be allowed to roam outdoors unattended or supervised, there is too much risk of injury or loss, and buyer agrees the cat will be indoors only, or the health warranty is voided. One or more scratching posts, kitty litter, fresh water and dry food will be provided for the cat at all times. The cat will be kept free from pests such as fleas, ear-mites, fungus, worms, etc. by example: Revolution, Advantage or Frontline. The cat must be examined by a licensed veterinarian, for a health check within 72 hours (3Days) after receiving your cat/kitten. Purchaser is responsible for entire vet bill. If it is found that there is any serious life threatening health question, purchaser has 48 hours after the veterinary examination in which to ask for a replacement cat/kitten. This request MUST accompany a letter from your veterinarian stating why the cats health is in question. If purchaser fails to comply with any aspect of this agreement, purchaser forfeits any or all rights purchaser may otherwise have. Furrballz Ragdoll kittens have a FOUR year guarantee against lethal genetic or congenital defects from the date of this contract. If kitten should die or be destroyed due to a genetic defect during this period Furrballz Ragdolls agrees to replace the cat/kitten with the next available cat/kitten of like quality, upon being provided with a necropsy (autopsy) report from a licensed, impartial veterinary pathologist and/or vet records indicating diagnoses from at least two examinations from different Vets prior to death. The report must state that death was unquestionably a genetic defect. Furrballz Ragdolls will not be responsible for any shipping or transportation costs. In the event of a sudden or unexplained death, purchaser agrees to have an autopsy performed by a licensed veterinary pathologist and to forward the report to Furrballz Ragdolls. Furrballz Ragdolls, at their own discretion, may replace cat after the genetic guarantee has expired. Full medical history must be supplied to Furrballz Ragdolls. Please Note: If you the buyer forfeits your right to a replacement cat/kitten there will be NO refunds. If owner finds problem with cat/Kitten after the 72 hour (3Days) veterinarian examination, the buyer agrees to allow Furrballz Ragdolls full compliance to be in contact with the buyers vet, in order to ask questions, as well as keeping up to date on the health of each of our cats/kittens. If cat is to be found mistreated, neglected or ill for an unreasonable length of time when with purchaser, Furrballz Ragdolls reserves the right to request buyer to surrender the cat/kitten to Furrballz Ragdolls with no reimbursement or refund to buyer. Allergic reaction to the cat is the responsibility of the buyer, but Furrballz Ragdolls will assist buyer in finding a new home for cat/kitten bread by Furrballz Ragdolls. Furrballz Ragdolls will not be held responsible for any type of common feline infections known to affect cats beyond the 72 hour (3Days) health guarantee. 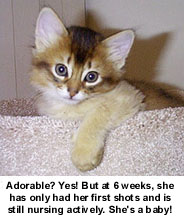 Buyer agrees there are common infections cats are often subject to suffer, and are beyond the control of the breeder Furrballz Ragdolls. 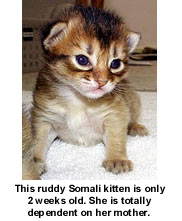 If the cat/kitten has been purchased as a pet only and as such has been de-sexed prior to sale. The cat/kittens are currently registered as a litter, parents pedigrees available at all times, registered pedigrees available for individual kittens on request. FURRBALLZ RAGDOLLS CATTERY'S LEGAL LIABILITY IS LIMITED TO THE COST OF THE CAT/KITTEN PAID UP TO DATE, MINUS THE NON-REFUNDABLE DEPOSIT. PLEASE ASK ANY CONTRACT RELATED QUESTIONS PRIOR TO SIGNING THIS DOCUMENT. Refund - if any - is up to the discretion of the breeder Furrballz Ragdolls. This is a legal and binding document. All buyers agree to forward all medical records and properly signed registration papers should the cat have to be surrendered back to Furrballz Ragdolls due to any breech of contract mentioned above, with no reimbursements to buyer. Effective date of purchase: ___/___/20__. 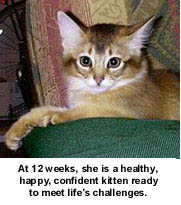 From time to time, we get feedback from prospective kitten owners who believe they need to receive their kitten at a younger age than we allow them to leave because other 'Breeders' do and they have previously always owned little babies from 6wks of age. On one hand, we can understand you wanting your kitten from a tiny baby, which is one of the reasons we allow people to come out as often as they can organise with us, to visit their baby until they leave us. It would also be alot cheaper for our 'overheads' to allow them to leave at a young age, as they eat ALOT once they get to 8wks of age! We hope that the article below will help you realise that good decent and ethical Breeders will not compromise with you over the age a kitten leaves us because it really IS for the BEST interests of you and the kittens' future.